The French president said Ali Khamenei's recent comments were likely to raise tensions in international talks over Iran's nuclear program. A new round of Iran nuclear talks began in fits and starts Wednesday, with the two sides ending a first session just minutes after it began amid warnings from Iran's supreme leader of "red lines" beyond which his country will not compromise. Still, both sides indicated a first-step agreement was possible on a deal to roll back Iran's nuclear program in exchange for limited sanctions relief, despite strong opposition from Israel and unease in both Congress and among Iranian hard-liners. President Barack Obama appears determined to reach such an agreement, which could be a major step toward reconciliation between the United States and a former ally that turned adversary after the Islamic Revolution of 1979. But America's longtime allies Israel and Saudi Arabia fear a deal will fall short of ending the Iranian threat and that a resurgent Iran will transform the balance of power in the Middle East. A senior U.S. official said Wednesday's brief plenary was only a formality and that bilateral meetings would continue through the evening to try to hammer out the first steps of a deal. She demanded anonymity under U.S. government briefing rules. However, there was also tough talk, reflecting tensions from nearly a decade of negotiations that have begun to make headway only recently. While voicing support for the talks, Iran's supreme Leader, Ayatollah Ali Khamenei, insisted there are limits to the concessions Tehran will make. And he blasted Israel as "the rabid dog of the region" — comments rejected by French President Francois Hollande as "unacceptable." French spokeswoman Najat Vallaud-Belkacem told reporters in Paris that such statements complicate the talks, but France still hopes for a deal and its position has not changed. At the previous round earlier this month, France said it wanted tough conditions in any preliminary deal with Iran, and those negotiations then ended with both sides speaking of progress but continued differences on a final agreement. Khamenei gave no further details in a speech to a paramilitary group aimed at both placating hard-liners and showing his backing for the Iranian officials meeting with international negotiators in Geneva. But his mention of Iran's "nuclear rights" was widely interpreted as a reference to uranium enrichment. For his part, Israeli Prime Minister Benjamin Netanyahu pushed ahead with criticism of what he asserts is a deal in the making that will give Iran too much for too little in return. Netanyahu, in Moscow to meet with President Vladimir Putin, renewed his demand for a full stop to all Iranian nuclear programs that could be turned from peaceful uses to making weapons. He said that Israel wants to see a negotiated settlement, but added that it must be "genuine and real." "Israel believes that the international community must unequivocally ensure the fulfillment of the U.N. Security Council's decisions so that uranium enrichment ends, centrifuges are dismantled, enriched material is taken out of Iran and the reactor in Arak is dismantled," Netanyahu said, referring to Iran's plutonium reactor under construction. Putin had no public reaction to Netanyahu's comments. "We expect that mutually acceptable solutions will be found shortly," he told reporters. » WorldViews: Americans support an Iran nuclear deal 2 to 1. That’s a big deal. » How Is Hamid Karzai Still Standing? Enemies left, enemies right, and then there’s his family. Building an Afghan legacy is even more complicated than it appears. Presidents Barack Obama and Bill Clinton haven't always gotten along -- especially when Obama ran against Hillary Clinton in 2008 -- but the current president couldn't have been more effusive about his predecessor on Wednesday. 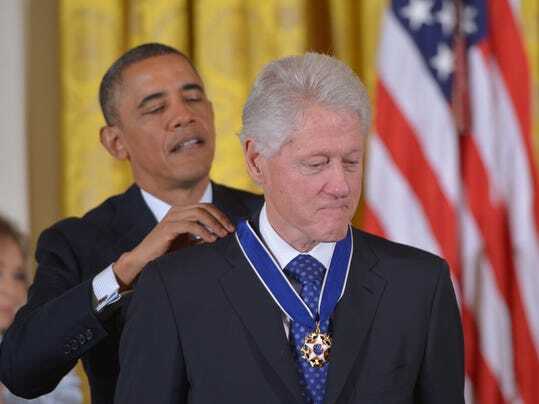 In awarding Clinton the Presidential Medal of Freedom, Obama said he is grateful for "the advice and counsel that you've offered me -- on and off the golf course.And most importantly, for your lifesaving work around the world, which represents what's the very best in America." "Now, last, but never least, we honor a leader who we still remember with such extraordinary fondness. He still remembers as a child waving goodbye to his mom -- tears in her eyes -- as she went off to nursing school so she could provide for her family. "And I think lifting up families like his own became the story of Bill Clinton's life. He remembered what his mom had to do on behalf of him and he wanted to make sure that he made life better and easier for so many people all across the country that were struggling in those same ways and had those same hopes and dreams. "So as a governor, he transformed education so more kids could pursue those dreams. "As President, he proved that, with the right choices, you could grow the economy, lift people out of poverty. We could shrink our deficits and still invest in our families, our health, our schools, science, technology. In other words, we can go farther when we look out for each other. "And as we've all seen, as President, he was just getting started. He doesn't stop. He's helped lead relief efforts after the Asian tsunami, Hurricane Katrina, the Haiti earthquake. His foundation and global initiative have helped to save or improve the lives of literally hundreds of millions of people. "And, of course, I am most grateful for his patience during the endless travels of my Secretary of State. "So I'm grateful, Bill, as well for the advice and counsel that you've offered me on and off the golf course. And most importantly, for your lifesaving work around the world, which represents what's the very best in America. "So thank you so much, President Clinton." He's unlikely to break a world record or even win a medal but New Zealand's Blake Skjellerup is likely to generate plenty of headlines if he gets to February's Winter Olympics. J. Edgar Hoover’s FBI secretly monitored David Frost’s US program to keep tabs on his left-wing guests – and once even planted an undercover agent in his New York studio audience, according to the famed Brit talk show host’s FBI file, obtained by The Post. Guests that got the feds’ attention included Johnson-era Attorney General Ramsey Clark, economist John Kenneth Galbraith and black nationalist Stokely Carmichael among others, according to the 45-page dossier obtained under the Freedom of Information Act. Other Frost guests on the FBI’s radar included folkie Joan Baez and Sen. Edmund Muskie, both critics of the Vietnam War, and Nixon Attorney General John Mitchell, who praised the bureau, the FBI memos revealed. Viva earned the bureau’s ire because of comments she shared with Frost that were deemed “highly critical of the Government’s position” concerning an anti-Vietnam War activist. “Warhol, of course, is regarded as the leading producer of so-called ‘underground films,’” the FBI memo said, noting that Warhol “was once the subject” of a past FBI criminal obscenity probe tied to his film “Lonesome Cowboys,” which starred Viva. The memo did not recommend any follow-up action regarding Viva. “I am writing as a long time admirer of yours to ask if you would consider taking part in a special conversation for television,” Frost wrote in his fawning missive. “I would love to have the privilege of talking with you . . . and television viewers throughout the world would love to hear,” wrote Frost, who first gained fame as a host of the satirical news show “That Was the Week That Was,” that aired in the early ‘60s in both the UK and US. But the FBI boss – who had targeted dozens of celebs for surveillance, including Frank Sinatra, Bud Abbott and Lucille Ball – declined Frost’s invitation in a polite letter. “I wish I could give you a more favorable response [but] the pressure of my official duties and the number of similar requests have made it necessary to decline all such proposals,” Hoover wrote. Instead, Hoover ordered up a confidential FBI intelligence check on Frost – that revealed nothing of consequence – while arranging to have bureau agents watch the show to monitor its left-wing celebrity guests. Over the next two years, during a volatile period in the country’s history marked by urban riots and violent anti-war protests, Hoover’s agents painstakingly noted any comments that could be considered un-American – as well as anything negative about the bureau itself, the FBI memos revealed. Clark – now an 85-year-old West Village resident – was of special interest because of his outspoken anti-Vietnam War and civil libertarian views. During an appearance on Aug. 5, 1969, Clark called wiretapping “immoral” and criticized the bureau’s approach to crime fighting. But Frost then brought on NYPD detective Ralph Salerno to defend wiretapping, and the cop played a tape of two mobsters plotting to rub out an informant, an FBI memo said. By January 1970, the bureau concluded that regular monitoring of the gab fest was a waste of time – but that certain shows should be watched depending on the guest list. “Regularly monitoring of this program has proved to be entirely unproductive … daily monitoring should be discontinued,” the memo read. That Nov. 18, however, an agent was sent into Frost’s audience, taking a seat for a live taping at the show’s West 44th Street studio of another appearance by Clark, who was sharing his views on crime and the Mafia. The unidentified agent dissected Clark’s critical comments in a five-page memo passed along to bureau higher-ups, a month before the show was aired. The agent also noted that Frost at the end of the show invited Hoover to appear to rebut the charges. Agents also watched shows featuring Galbraith, who had personally disparaged Hoover and the bureau, and Carmichael, the “notorious black revolutionary” whom the feds said harbored “illogical” views. Carmichael, according to an April 14, 1970 memo, “viciously attacked the US government as tyrannical and oppressive,” and argued that black entertainers were discriminated against on TV. But the “audience …jeered his comments in this regard,” the memo noted. The file also includes an Oct. 15, 1970 letter to Hoover from an unnamed citizen for not “disassociating himself” from remarks critical of then VP Spiro Agnew by guest Gore Vidal, who suggested that disgruntled Americans could “blow up the capitol AND Mr. Agnew!” according to the letter. The dossier – which also includes news clippings about Frost from The New York Times magazine – indicates FBI memos were routinely being funneled to Hoover’s two most trusted lieutenants, Associate Director Clyde Tolson and Cartha DeLoach, third-in-charge at the bureau. There was no indication that Frost had ever been put under FBI surveillance apart from his show or been targeted by the FBI for wiretapping. Frost – who finished his career hosting “Frost Over the World” on Al Jazeera English from 2006 to 2012 – forged a reputation as a consummate sophisticate, talented writer, comedian and bon vivant, was knighted by Queen Elizabeth in 1993. Among his most famous interviews was his aggressive questioning of ex-president Richard Nixon in 1977. His shows also featured the Beatles, Muhammad Ali and eight British prime ministers. The son of a Virginia state senator stabbed his father multiple times before committing suicide by shooting himself in the politician's home, police have said. Democratic Senator Creigh Deeds was hospitalised in a critical condition, later upgraded to fair, after sustaining stab wounds to his head and chest in an apparent attack by his 24-year-old son Gus. Virginia police spokeswoman Corinne Geller said authorities were still investigating the attack, but it appeared to be an attempted murder and suicide. She said Mr Deeds had been able to walk away from his home to a nearby road where a cousin who was driving by happened to spot the senator. They then drove to the cousin's home and called 911. Police sent to the senator's house found the body of his son, Gus Deeds, with a gunshot wound. Ms Geller said investigators were still trying to figure out a motive for the attack and the sequence of events. "It's a very complex investigation," she said. "We are still piecing together the exact circumstances that led up to the altercation and then followed afterwards, but based on the evidence we have right now we are looking into this as an attempted murder and suicide." She said police had spoken to the senator, but would not reveal what he said. Ms Geller added authorities were not looking for any suspects. Gus Deeds, one of the senator's four adult children, had reportedly been evaluated for a mental health issue on Monday. But he was sent home after the clinic was unable to find a bed at a psychiatric facility. Gus Deeds dropped out of the College of William and Mary last month, where he had been enrolled on and off since 2007, a school spokesman said. He took a semester off in 2009 to join his father on the campaign trail. Mr Deeds, 55, was elected to the House of Delegates in 1991 and to the state Senate in 2001. The former Bath County prosecutor ran for attorney general in 2005, but lost to Republican Bob McDonnell, who defeated him a second time in the race for governor in 2009. Mr Deeds and his wife Pam divorced shortly after the 2009 campaign.